The crazy weather year of 2008 on California’s North Coast somehow managed to produce many highly concentrated, stylish, complex and balanced wines that are just now entering their periods of peak pleasure. As the challenges of difficult growing seasons fade with time, two things happen. First, in the memory of winemakers, rain events magically become less extreme: the actual torrential rainfall that plagued a harvest shrinks to moderate precipitation and eventually to a vague recollection of moisture. Freakishly cool or brutally hot harvest weather or damaging hail storms are virtually forgotten, as the body has a short memory for pain. At the same time, as the wines themselves mature and are transformed, they reveal themselves to be less extreme after all, until at some point it can be next to impossible to find the insanity of the vintage in the bottle. I’ve seen these patterns play out again and again in temperate wine-growing areas like Bordeaux, Burgundy and northern Italy—and even in normally hot, bone-dry growing regions. Two thousand eight was such a year for California’s North Coast. The 2008 vintage on California’s North Coast was a terrifying roller-coaster ride; I originally described it as a growing season that witnessed every possible plague except frogs and boils. Others referred to it as a year of fire and ice. As I noted in my initial review of the year’s wines, the 2008 season began with an epic and extended spring frost from late March through the end of April, which cut crop levels dramatically in many areas, even in some steep hillside sites that normally escape this peril as the frigid air slides down to the valley floor. Conditions were as perilous in much of inland Sonoma County as they were in Napa Valley. Night after night after night, the frost alarms went off before dawn and the wind machines and sprinkler systems went into action in vineyards lucky enough to have them. Following normal copious winter rainfall in January and a bit of final precipitation in February, 2008 also brought drought conditions: at the Oakville weather station a total of about one inch of rain was recorded between the beginning of March and the end of September. The flowering was drawn out and the fruit set was very uneven in many areas owing to the dry spring and the effects of the frost. Even where the vines flowered reasonably well, cluster maturity often varied widely from vine to vine, and even within the same vines, threatening to throw off the ultimate balance of the wines. With many frost-hit properties forced by financial considerations to retain their second-generation grapes, it was a challenge through the summer to crop-thin so that this later fruit would have a chance to ripen, and to green-harvest assiduously in order to minimize the irregularity in ripeness of the fruit that remained on the vines. The summer featured a series of heat spikes and higher-than-average temperatures. The stop-start nature of the weather meant that the vines were constantly shutting down and then restarting again. There was no prolonged period of steady maturation and thus vine physiology remained unpredictable. The veraison in many areas was drawn out. And the summer of 2008 also brought dozens of lightning-generated brush fires that burned out of control in Mendocino County from late June through the end of July. Drifting smoke seriously affected vineyards in Anderson Valley and much of Mendocino County, with some vineyards in Sonoma County, mostly close to the coast, also affected. Even some mountaintop Napa Valley producers told me at the time that there were some smoky days in their vines. Happily, most quality-conscious producers on the North Coast with reputations to protect either did not make wine from smoke-tainted grapes or declassified this juice into cheaper appellation bottlings, and a few top growers did not even ask their clients to take their fruit. Other wineries used a variety of high-tech filtration and reverse osmosis techniques to try to minimize smoke taint but may have stripped their wines of texture and character in the process. But the fires ultimately caused little damage to the grapes in Napa Valley. The most damaging late-summer heat spike occurred during the last several days of August and first week of September, when afternoon temperatures in hotter sections of Napa Valley routinely soared into triple digits. 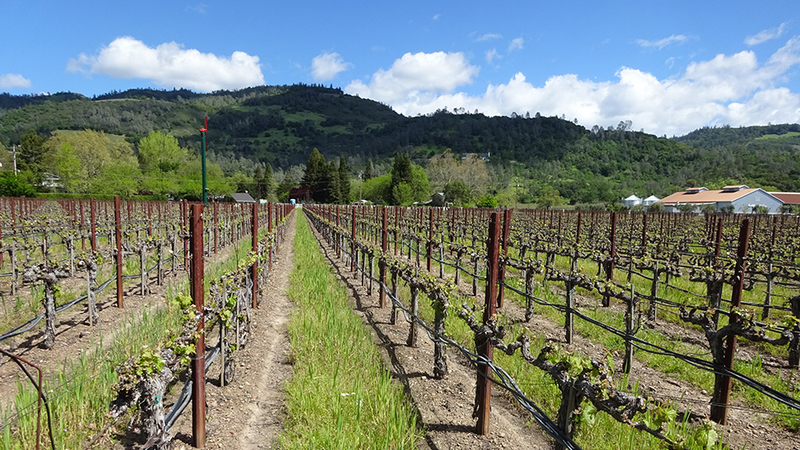 By then, some wineries that had used much of their finite water supplies for frost protection in the spring had run out of water, which meant that their vines were pretty much on their own during the hot, dry late-season weather. Many growers thus had no choice but to bring in their grapes quickly, even where the fruit had not achieved full phenolic maturity. Perhaps worst affected was early-ripening Pinot Noir in Carneros and across parts of Sonoma County, which could quickly lose its aromatic high notes. 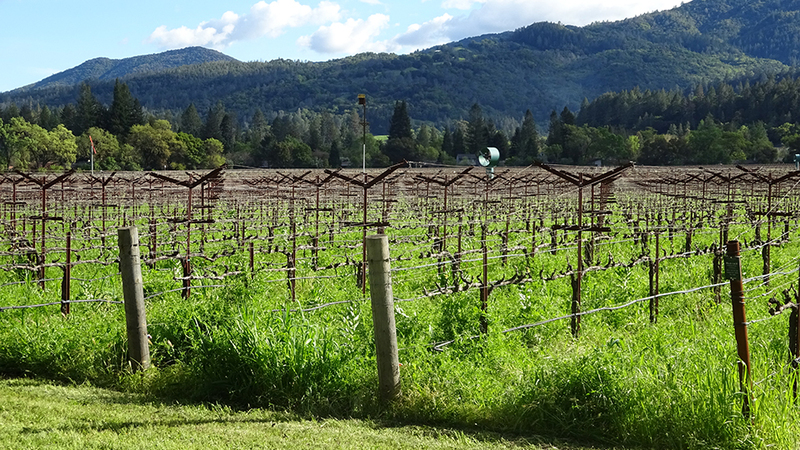 At the other extreme were Cabernet vineyards in cooler areas, such as east-facing slopes in the southern portion of Napa Valley, where the fruit was often left on the vines until well into October. Continuing the up-and-down nature of the growing season, the middle two weeks of September then turned unseasonably cool, and most growers could let their fruit hang in the hope of getting it fully ripe. But in many areas, the extreme heat of late August and early September had affected the photosynthetic capacity of the vines and the health of the leaves, and grape sugars did not rise much even during favorable weather. But skin tannins, which had softened in the heat, continued to mature. Winemakers who were obsessed with letting their grapes hang as long as possible (a shrinking group nowadays) were likely to make soft wines in 2008, and of course some waited too long, losing structure and acidity and picking dehydrated berries. The end of the month turned quite warm again and the pattern of alternating very warm and cooler periods continued through October. Phenolic concentration (not to mention grape sugars) was often quite high as the loose clusters widely seen in 2008 permitted exposure of the entire surface of the grapes to air and light, allowing for more homogeneous ripeness of the phenolic compounds in the grape skins. As might be expected, where the range of ripeness within a vineyard was pronounced, a key to success in 2008 was harvesting in a series of passes, but relatively few vine owners can afford this costly process. While the extremes of the year were unusual by California standards, growers in Europe have been dealing with vintages like this for centuries. Clearly, the challenges of the growing season required much more work in the vines than usual, followed by stringent use of sorting tables to eliminate overripe and underripe fruit. Experienced grape-growers and winemakers were at a distinct advantage. While the 2008 vintage was uneven from the start, it was also a pleasant surprise, due in large part to the mostly low yields and vine stress, which made for small, deeply colored, highly concentrated grapes. When the fruit was fully ripe, the skins were rich in phenolic material and easy to extract, and many winemakers carried out gentle, shorter vinifications, particularly if they were concerned that the seeds were not fully ripe. This, along with the warmer-than-average temperatures during the second half of the summer and early fall, generally resulted in fruit-driven wines that were surprisingly accessible in their youth. When I first tasted these wines alongside the ‘07s, they showed considerable early aromatic appeal. No doubt the complexity of these wines derived in part from a wider range of fruit ripeness than is usual in Napa Valley, but that’s not necessarily a bad thing, as many decades of claret proved in the 19th and 20th centuries. In my extensive tastings of these wines ten years later, in St. Helena in March and at home in New York City in April, the better bottles stood out not only for their concentration but for their harmoniousness—and often for their silky, even chocolatey sweetness, plush middle palates with surprising definition, and smooth, integrated tannins. They are fun to drink today but they have the energy and balance to go on for another decade or more—and possibly much longer than that. From their aromatic complexity and lively floral and mineral qualities, one would never guess that some of these wines came from a stressful growing season. The wines of 2008 are not as consistently strong as their siblings from ’07, ’09 or ’10, but the vintage produced many outstanding wines. But I also found the vintage’s vicissitudes in a number of bottles that I tasted. Many display a more pronounced herbal quality—sometimes weedy or distinctly peppery—than one normally finds in years with steadier ripening. At the other extreme, some ‘08s show an exotic ripeness that can verge on port-like. And, of course, quite a few irregularly ripe wines show both extremes. Others still show a rather stunted medicinal quality ten years after the harvest, with their tannins revealing incomplete ripeness or even a dry edge. And, of course, I tasted many wines that ultimately were defeated by the challenging growing season: wines dominated by dehydrated fruit character; wines that are green, lean or unacceptably rustic; wines that finish gritty or dry; wines that show oxidative character or are already in decline. As I am hesitant to ask wineries to provide expensive and often scarce samples of older bottles, I followed my previous rule of not retasting wines that I had sampled last year. For these items—from Bond and Seavey—I have merely inserted my most recent tasting notes. As I tasted these wines last year in the context of vertical tastings, their scores may appear a bit low. (For example, the Bond ‘08s followed the denser and mostly showier ‘09s last March.) I suspect that they would have rated a point higher in the context of my horizontal tastings this spring, but that’s the way the cork crumbles. Also, as in past years, I included several of my perennial favorites made from vineyards outside Napa Valley, not to mention several others made from Napa Valley fruit by producers located in Sonoma County—and thus ineligible to belong to the Napa Valley Vintners Association, which helped me collect my samples and provided me with a cool, quiet place to taste them.